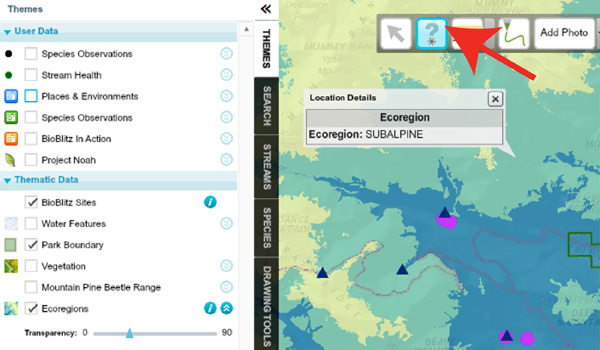 FieldScope is a National Geographic tool for exploring, sharing, and analyzing real-world data sets, including observations from students and scientists studying the world around them. 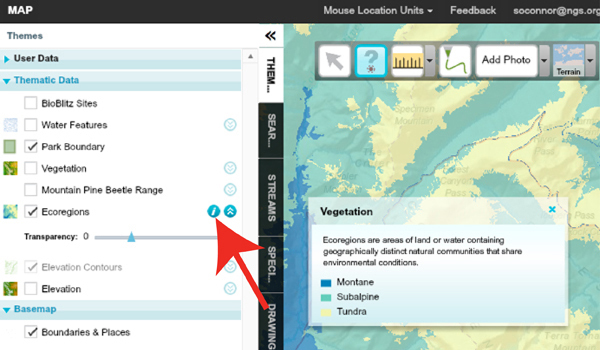 Before getting started with FieldScope take a tour to learn about what you can do with this online tool. 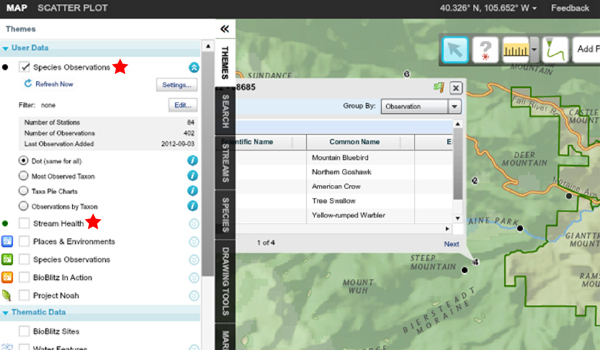 FieldScope offers a suite of spatial datasets for you to explore including vegetation and elevation. Explore the Themes tab to turn on and off these layers of data and explore relationships. Manipulate the transparency of different layers using the sliding scale bar to look for patterns between one or more themes. When you are viewing a map layer, click on the information icon to view the map legend. Photos help illustrate the diversity of ecosystems and habitats across Rocky Mountain National Park. 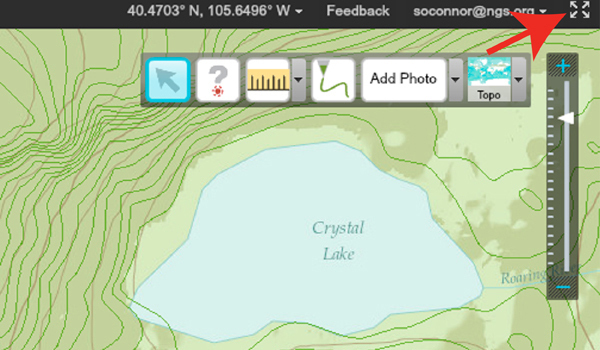 Switch between different styles of base maps including a custom layer from National Geographic, satellite, terrain, and topographic views. 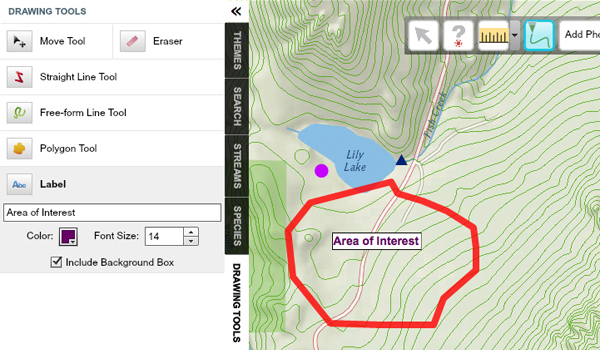 Select the query tool and click on the map to return information about the layers at that specific point. 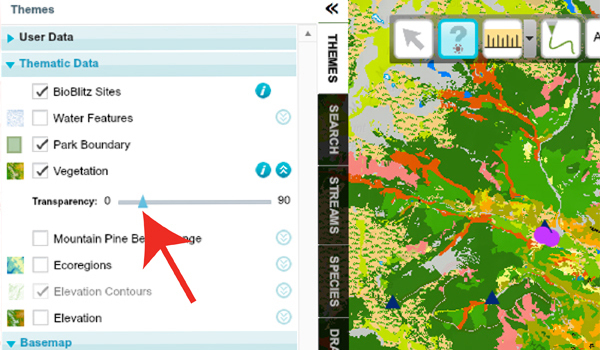 To explore the Mountain Pine Beetle progression, first select two different years to view, then move the vertical bar back and forth across the map to compare the selected years. 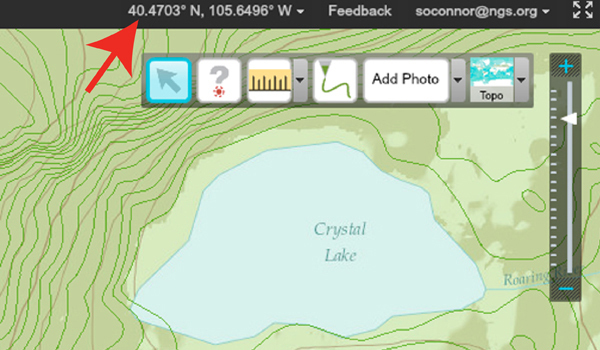 Use a set of drawing tools to mark up the map with shapes, lines, and labels. 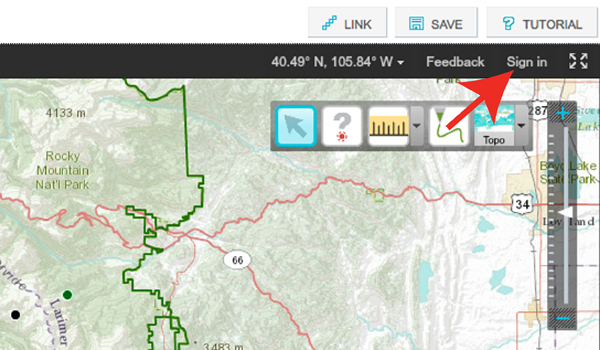 Measure distances on the map in either miles or kilometers. 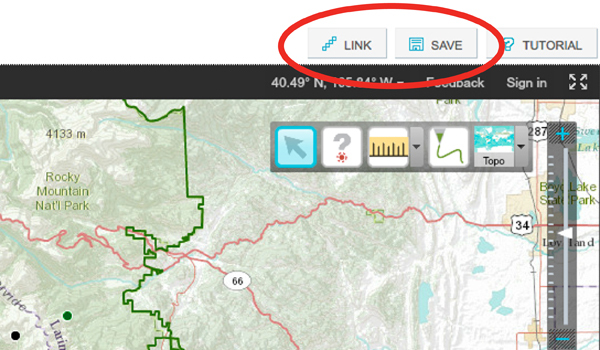 Select the tool, click once on the map and move your mouse. Click again and the distance value will appear along your line segment. 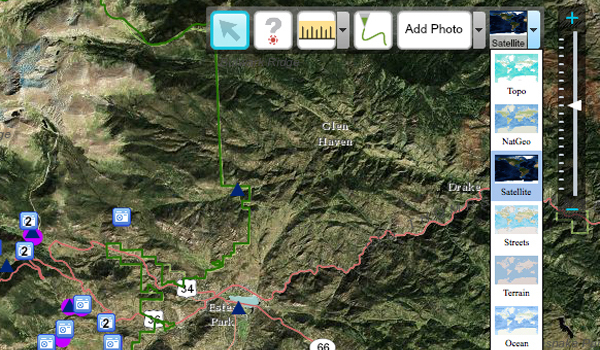 Keep clicking and panning to measure additional segments and the total distance will display at the end of your line. 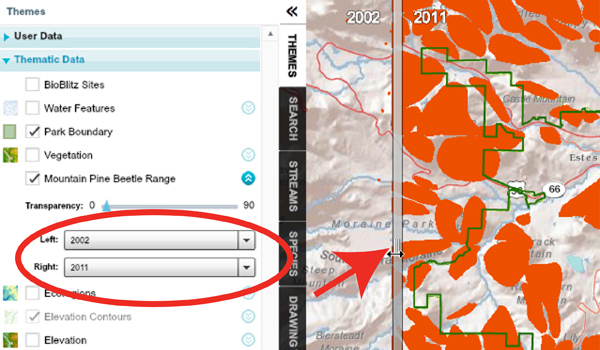 Double-click to finish and select the arrow tool when you are done measuring. 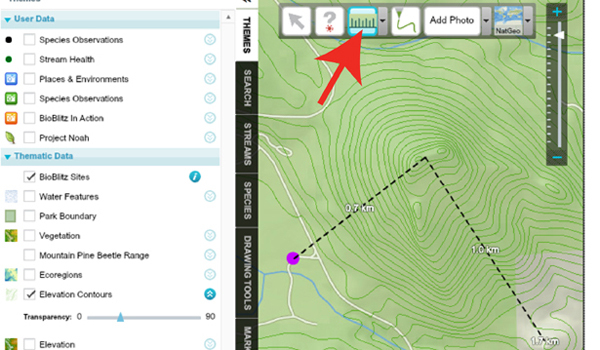 Identify your geographic position on the map using the latitude and longitude display at the top right of the frame. The latitude and longitude values change as you pan around the map. 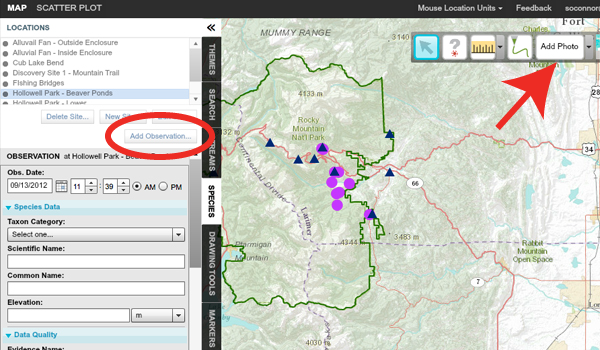 To add data your water quality or species inventory data to the project you must first register an account and login. 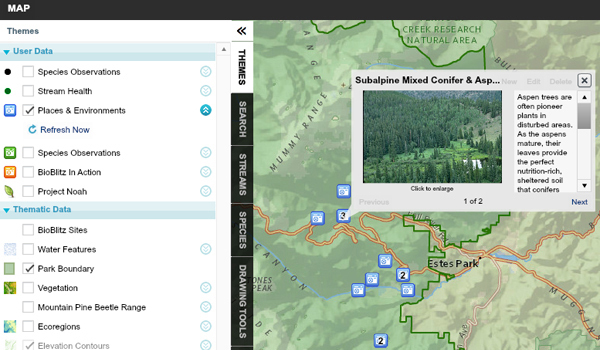 Once signed in, you will see two new tabs for adding stream health and species inventory data. 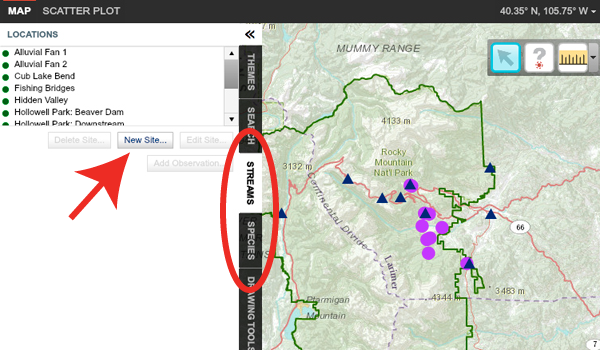 Click on a tab and click New Site to add a new observation location. Then click on the map to place your new site. After adding a new site, the site name will appear in the list. Click Add Observation to add your data. You can also add photos collected in the field. 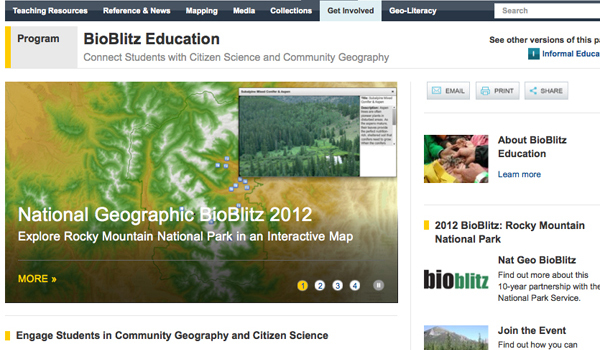 Enjoy exploring the National Geographic Rocky Mountain National Park BioBlitz FieldScope project and visit NatGeoEd.org/BioBlitz for more resources.